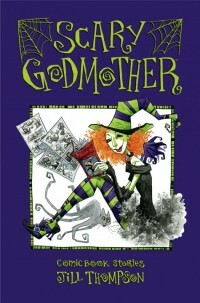 Scary Godmother (Dark Horse Comics): Okay, so it’s not the darkest, most twisted comic book out there, but it’s right in line with the season. Jill Thompson‘s Scary Godmother is possibly the best way to get yourself and your theoretical children in the mood for Halloween. Thompson has shown herself through works like The Little Endless Storybooks to be able to take some of the darkest themes and make them fun. And in this book, she takes the monsters, witches, and ghouls and makes it child-friendly while not talking down to adult readers. Her artwork is always beautiful and her story telling is top tier. This series can be seen in various media, but this is a comic book list. And if you’re wanting to either give away a comic to trick or treaters, or if you’re just wanting to check something out that’s not blood soaked and terrifying, this book should be right up your alley. So, if you haven’t gotten around to checking out Scary Godmother, right now would be the perfect time. Batgirl #14 (DC Comics): There aren’t going to be many times when I suggest a more “fun” look into horror comics, so it’s the best that I go ahead and get them out of the way at the top of this list. And the one word that best describes Bryan Q. Miller’s Batgirl is “fun.” In this issue, Batgirl teams up with Supergirl to take on the likes of 13 different Draculas. The story goes like this, it’s Halloween on the campus of Gotham U. and Supergirl comes to visit the young Stephanie Brown. And in the spirit of Halloween, the campus theater is showing a screening of Dracula. 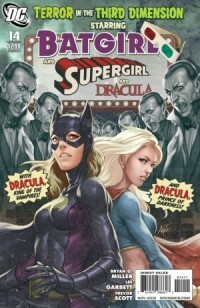 Hijinks ensue, however when the title character is brought to life and multiplied through nefarious means, so it’s up to the team of Batgirl and Supergirl to take on their vampiric foes. It’s a incredible ride from the front cover to the last page, and if you haven’t checked out this series, make sure you do so, ASAP. And if you have read it, read it again! It’s the perfect time of year! The Walking Dead (Image Comics/Skybound): How could any list of horror comics be complete without The Walking Dead? 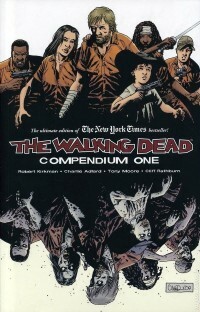 Robert Kirkman, Tony Moore, and Charlie Adlard have filled the pages of these issues with their blood, sweat and tears, and it’s entirely apparent in each comic. The creators have told an incredible tale of the zombie apocalypse and those that are trying to survive it. It’s more of a story about human nature and how we react in the face of tragedy and disaster, but the zombies are still there. It’s not a comic that’s intended to scare, but the dark elements certainly send chills up the spines of its readers. Disturbingly twisted, sometimes scary, The Walking Dead has earned its place in most readers top comic lists, and it’s even spawned an incredibly successful television show on AMC. The Walking Dead is considered by some as the absolute best comic to read at this time of year. And I doubt it’s a coincidence that AMC has been starting each season of the television show in October. 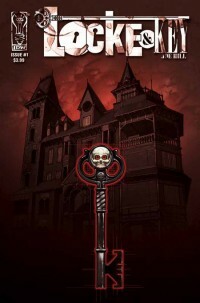 Locke and Key (IDW Publishing): I’ve oftentimes called this comic the best book that is currently being published, and at this moment, my mind has not been changed. Locke and Key is the story of family whose life is turned upside down with the death of their father. “Supernatural” and “horror” are unfair names to describe Joe Hill and Gabriel Rodriguez‘s definitive work. It’s a story that transcends genre and barriers, but don’t get me wrong, this can be one messed up comic. You see, there’s a dark history to the Locke family that involves demons, hauntings, and sorcery and each issue brings another element to the story. It’s a wonderful book, and it embodies the Halloween season in the best of ways. There are hauntings, murder, and possession, but there’s also so much more. To say the book is unsettling would be an understatement. The story immerses the reader in the town of Lovecraft, Massachusetts, and while it’s an exciting place to be, it definitely doesn’t feel like the safest. During the chilly nights of this season, there’s not a better book to read than Locke and Key. 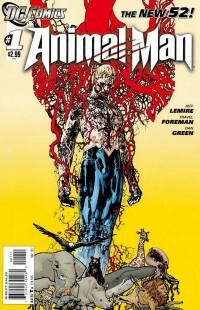 Animal Man (DC Comics – 2011): This comic and the next one go hand in hand. Both are born of the recent DC Relaunch, both feature more obscure DC Comics heroes, and both are as creepy as can be imagined. In Jeff Lemire‘s Animal Man, it’s the perfect set up of a horror comic. The life of Buddy Baker and his family is relatively slow and quite, but when the skeletal remains of the animals that are close to Buddy start rising from the dead at the call of his daughter, things get considerably more deranged. And I love it for that. The phenomenon is being referred to as “the red,” and that description alone makes my skin crawl. A lot has been going on in these two issues, and Travel Foreman‘s artwork of Animal Man’s dream sequences is some of the most haunting art in any comic being published right now. It’s just starting, but it’s a good start. 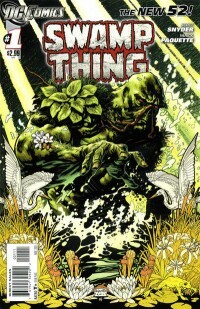 Swamp Thing (DC Comics – 2011): And in Scott Snyder‘s Swamp Thing, pretty much the same thing can be said. Snyder has an amazing track record with comics, especially in the horror genre, and with his take on Swamp Thing, he’s at his finest. Alongside artist Yannick Paquette, Snyder is telling a story of the Earth’s revenge on humanity and how they are enacting that vengeance. It’s dark, eerie, and the artwork sells the creepiness of the story. A lot of horrifying events are going down in the pages of this New 52 title, and it’s considered by most as one of the most exciting comics to come out of the DC Relaunch, but most importantly, it’s good. It’s incredibly difficult to go into a lot of detail with this run of Swamp Thing right now because it’s just starting. But like Animal Man, it’s off to a great start, and right now you can jump into at the beginning of the series. 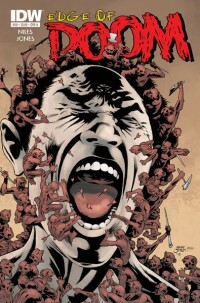 Hack/Slash (Image Comics): There are several different kinds of horror movies. There are ghost stories like Poltergeist, monster movies like Frankenstein, killer films like Psycho, and then there are the slashers. The slasher genre was mainly dominate in the 80s and inspired a bit of a re-genesis with late 90s films like Scream. Humor is laced throughout these movies while having a specific theme of moral superiority on the part of the killers. And then we have horror comics. Horror comics have all sorts of genres that mirror their film world counterparts, but only one that embodies the spirit of the slasher film. And that book is Hack/Slash from Tim Seeley. The majority of the humor in the book is directed right at the weird subculture of slasher fans that will watch a movie like Sleepaway Camp to cheer and laugh the entire time. I am one of those fans. And if you’re one of those fans, then Hack/Slash is the book for you. The comic follows Cassie Hack and Vlad, her monster-like companion, as they track down the worst of the worst. And then they kill them. These killers are traditionally the ones you’d see in these cult horror films, the kind that get killed and come back to life. Tim Seeley captures the essence of the cult fan and channels the energy into the comic to make something completely original while also giving a strong nod to these slasher films. The comic is full of bloody fun, and I can’t suggest it enough. 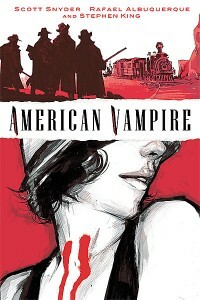 American Vampire (Vertigo/DC Comics): It’s not your traditional spooky horror comic, and although it’s got the word “Vampire” in the title, it’s not what the majority of our society thinks of as vampires anymore. Scott Snyder and Raphael Albuquerque are telling the story of different sects of vampires throughout America. And these vamps don’t sparkle, they rip your throat out. It’s an incredibly violent book, and while the writing makes the events happen, Albuquerque’s art drives the stake of fear directly into the heart of the reader. It’s scary at times, but you also cheer for the protagonist vampires no matter how furious they become. I’d say it’s more of a throwback to the vampires we saw before the Twilight era, but Anne Rice never wrote anything like this. The Vampire mythos is definitely within these pages, with some new details thrown in, but there is not another story like that of American Vampire. So when you hear the title, don’t think you know the story. You need to read this, and what better time to start than Halloween? 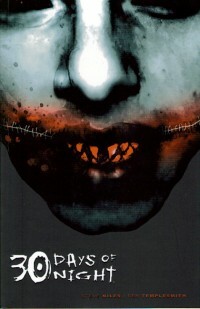 30 Days of Night (IDW Publishing): Steve Niles and Ben Templesmith are legends in the realm of horror comics. And this is this is where they earned that title. The comic takes place in a small town in Alaska where the sun does not rise for 30 days and 30 nights. To take advantage of the lack of sunlight, a group of grizzly, vicious vampires set their sights on this small city for month long feast on the people of this town. In the second vampire story of the list, 30 Days of Night is one of the best comics out there to showcase the most violent of vampiric killers. It went on to spawn off several different stories in the series, and was optioned for a series of movies. Unfortunately, the movies failed to grab the essence of the comics, 30 Days of Night is still one of the best horror comics in existence and should be read by every horror loving comic fan. 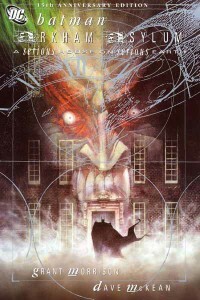 Arkham Asylum: A Serious House on Serious Earth (DC Comics): With one of his first stabs at The Dark Knight, Grant Morrison‘s Arkham Asylum delved into the madness of The Caped Crusader’s mind, as well as in the minds of his most feared enemies. Batman faces a gauntlet of villains in the graphic novel when The Joker springs his colleagues out of their cells and they take of the hospital for the criminally insane. Morrison uses these pages to discover the story of the asylum’s founder and how his curse has effected the spaces in between the stone walls. It’s horrifying in most portions of the story, and Dave McKean‘s photorealistic art adds to the creepy, almost disgusting nature of the story. Morrison’s work, as usual, is high concept. So it might not be for everyone. I mean, it’s not even one of my personal favorite Batman stories, and it’s one of my least favorite Morrison stories. But for the month of October, this horrifying take on The Batman is an absolute must read. 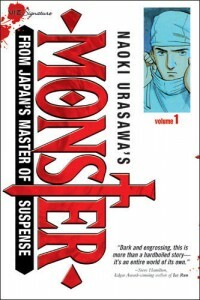 Naoki Urasawa’s Monster (VIZ Media): Although I have yet to complete this series, and some of the volumes seem to be out of print, Naoki Urasawa‘s Monster is my favorite manga that I’ve read at this point in my life. There story is about a young doctor who is on the way to an extremely successful life in the medical profession while trying to do the right thing. And since he tries to do the right thing, sometimes the politics of the medical world disagree with his choices, and when two young children whose parents had been murdered come into his life, Dr. Kenzo Tenma’s world turns completely upside down. Dead bodies pave the pages of this series, and it’s up to Tenma to clear his own name, but how can he do that when all the people around him begin perishing? That is one of the many questions asked in this book, but one of the more prominent themes is true evil. Simple and pure. This is my favorite manga. The writing is stellar, the story is one of the most intriguing stories I’ve ever experienced, and the art is perfect. A must read. Edge of Doom (IDW Publishing): Steve Niles. Kelley Jones. These two names should bring excitement to the hearts and minds of any fan of horror comics. And Edge of Doom showcases the talents of booth in some of the creepiest, most bizarre tales out there. The trade for this series collects five insane tales of death and insanity and is done in a spectacular manner. The creators of this book are the real stars of the series, and they deliver on each of the stories. For example, in the first issue a man who is on the brink of death and insanity discovers that his backyard is full of a civilization of tiny monsters that he’s convinced himself are trying to kill him. Instead of letting that happen, though he takes the offensive. The result of his actions are nothing short of shocking. And these themes continue throughout the series from these masters of horror. Both have a knack for telling the most terrifying of tales, and with Edge of Doom, there is no exception. It’s a nod to the days of EC Comics, and what could be better on Halloween? 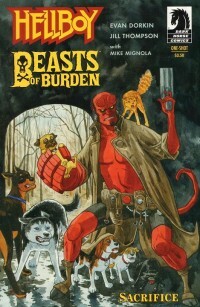 Beasts of Burden (Dark Horse Comics): Comic industry veterans Evan Dorkin and Jill Thompson have made their names within a variety of genres, but in Beasts of Burden they find a brand new voice. Taking the simple concept of neighborhood animals getting into a variety of adventures, Dorkin shows just how dark his mind can go. Because these animals don’t just go out to play when hijinks ensue, these pets play with dead things. Monsters, werewolves, zombies and ghosts are the supporting characters throughout this series. I mean, there’s even a team up with Hellboy! And while, generally, the dogs and cats are successful, they don’t always win. It’s book that likes to be silly at times, and the majority of the humor comes from the chemistry between each of the animals and the characterizations of the breeds, but Dorkin and Thompson don’t play softball in this, either. Some incredibly serious topics in the realm of animal rights come from time to time, and they don’t always promise the best of results. But if you’re looking for a horror comic that could give you everything you could possibly ask of a series, then you should be looking for Beasts of Burden. As I said, this isn’t necessarily a list of the best horror comics out there, but these are some of my favorites. And if you haven’t read these, you absolutely should. This weekend.